Sure, these bits make some tradeoffs, but are inexpensive router bit sets worth the money? In a nutshell, the main difference between these "bargain" bits and more expensive bits comes down to durability. High-performance bits like Arnana, CMT, and Freud are designed for industrial and commercial users. These high-end bits need to stay sharp day after day of hard use. Thirty-six router bits for $50 — how can that be? 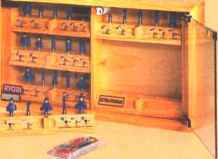 Flipping through just about any woodworking catalog you're sure to see inexpensive router bit sets (photo above and at left) that seem too good to be true. What makes these deals more amazing are finding similar bits just a few pages later that cost nearly $50 a piece. Looking at the pictures in the catalog, the bits look nearly identical. So what's the difference between bargain router bits and higher-priced models? To answer that question, you'll need to consider how the bits are manufactured. A Inexpensive router bit sets let you check out a wide range of profiles without spending a lot of money. workers. Some of these things are easy to see while others aren't very visible. VISIBLE DIFFERENCES. Several differences between high-quality and bargain bits that are visible can be picked out in the photo at right. One of the first things you'll notice is the carbide cutting edges. The carbide on the bargain bit (right) is thinner than the more expensive bit. Another thing to look at is the angle on the cutting edge. On bargain bits if s vertical. This means the bit has a chopping effect as it cuts. By contrast, the high-end bits use a sheer angle that's more expensive to produce. This change of angle results in a slicing cut that's much smoother. COATINGS. Another difference youH notice between the two bits shown here is their coatings. The red bit on the left has a Teflon-like coating bonded to the body. It prevents pitch buildup and reduces friction while cutting. On the other hand, the coating on the cheaper bit is nothing more than paint that quickly chips off. INVISIBLE DIFFERENCES. While you can see some differences, it's what you can't see that make the biggest impact on quality and cost. 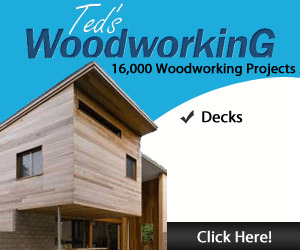 One way to reduce the cost of a bit is in the choice of materials. The steel used in the shank and body of lower-quality bits comes from less expensive alloys than those found in high-quality bits. Several high-end bit manufacturers like Amana and MLCS have answered the competition from inexpensive bits by launching new lines of bits, like you see in Anmna's Timberline series shown at left (see sources on page 49). Even well-known tool makers are getting into the game with their own lines of bits as well. These bits are often found in home improvement centers individually or in sets, like you see in the photo at right. For bits that you use more often, these mid-range bits are a good value. Contractor-grade bits can come individually or in sets. Built with higher-quality materials and cutting edges, these bits are designed to last longer than bargain bits. 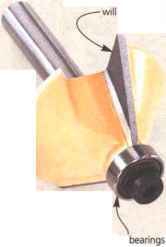 Non-stick coating reduces pitch buildup and reduces friction cost bits are sharpened, the manufacturers often eliminate the final polishing steps after grinding. While this makes the bit more affordable, the downside is that these inexpensive bits won't cut as efficiently. So, youU have to watch how fast you feed the router bit into the workpiece. Another drawback is that these bits won't stay sharp as long and can't be resharpened as many times. Knowing how the bits are made leads to a second question: How do these bits cut? After using both type of bits, the results surprised me. Initially, the bargain bits cut smooth and clean. In fact, I couldn't really see any difference between the two bits. The difference isn't in the first cut, or the second. The more I used the bargain bits, I noticed them cutting rougher as the carbide lost its edge. Eventually this causes tearout, heat buildup, and burning the workpiece. So does this mean that bargain bit sets aren't a good deal? 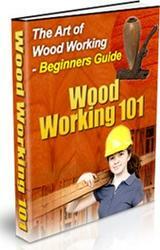 The answer depends on what you're looking for in router bits and how you use them. High-quality bearings run cool and smooth sets. If you're just getting into routing, a set like this will give you a good idea of the types of router bit profiles that are available. As you use your router bits, youU find yourself reaching for a few bits pretty often. And these bits will dull quickly. So you can replace them with higher-quality, longer-lasting bits. 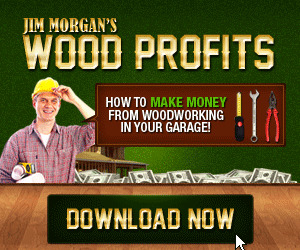 This way, you're putting your money in the bits you use most. There will be some bits from the set that you won't use much (or at all). But it's good to know you didn't spend a lot on them. Several manufacturers are offering "mid-range" bits that are designed for contractors and home woodworkers. You can read more about them in the box below. Falling somewhere between industrial-quality router bits and the bargain bits talked about above are "contractor-grade" bits. These bits have some of the same qualities as higher-priced bits, like better quality carbide and steel. These bits will last longer and will cut smoother than Higher-quality and precision the less expen-bearings grinding sivebits. Clean, splinter-free cuts. That's all I ask from my miter saw. And yet, as simple as that sounds, sometimes it seems like an impossible request. But I've learned that the secret to getting great cuts with a miter saw doesn't have as much to do with the saw as it does with the blade. Nearly every saw blade manufacturer offers at least a couple of blades that have been designed specifically for miter saws. So the question is, "What makes a miter saw blade different than other types of blades?" WHAT TO LOOK FOR. Essentially, there are three things that a miter saw blade needs to do. First and foremost, it needs to make clean, smooth crosscuts. Second, it shouldn't "grab" the wood as it cuts. And third, it must be able to power through the cut, without bogging down or stalling the motor. Miter saw blade manufacturers meet these challenges in a number of ways. 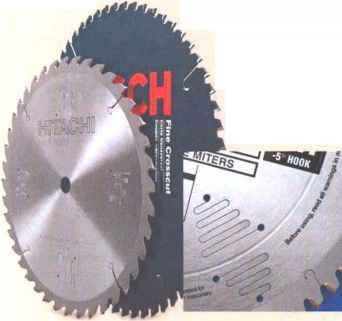 To begin with, since miter saws are used exclusively for crosscuts and miter cuts, miter saw blades typ ically have lots of teeth. For a 10"-dia. miter saw blade, 60 teeth are standard, while 12"-dia. blades usually have 80 teeth. More teeth mean a smoother cut. But there's a downside to having all those teeth. The more teeth on a blade, the more friction is created. And this translates to greater heat buildup. This not only leads to burning on the workpiece, but it can cause the plate of the blade to expand and distort, which can produce a rough cut. To help combat this, most manufacturers add expansion slots to their blades (see inset photo at left). As their name implies, these slots are designed to allow the outer edge of the blade to expand slightly as friction causes the blade to heat up. Laser cut expansion slots at the edge of the blade allow it to expand without deforming as the plate of the blade heats up. 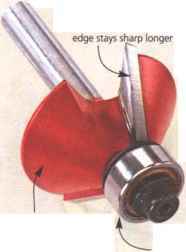 The "squiggly" slots closer to the center of the blade are to help deaden vibration. Again, there's a trade-off. The lower the hook angle, the more power it takes to cut through the wood. That's because the teeth are hitting the wood almost head on, instead of slicing through the wood, see right drawing above. Despite this, I still prefer a blade with a 0° or negative hook angle, especially when using a sliding miter saw. The teeth on a miter saw blade are beveled in alternating directions to cleanly score the wood fibers along the sides of the cut. Every so often, I'll hear a group of woodworkers debating whether it's better to pull or push the blade through a cut when using a sliding compound miter saw. The short answer is that it's better to push. Here's why. If you pull the blade through the workpiece, the direction of the blade's rotation can pull the saw forward with great force, causing injury to you or damage to the saw. If I'm cutting narrow workpieces, I generally just bring the blade down on the piece in a single, chopping motion (see photo on opposite page). But for wider pieces, I lift the blade and slide it back before squeezing the trigger. Then with the saw running, I lower it into the workpiece and push it forward, see photo at right. While the number of teeth is definitely a factor in the quality of cut, the shape and profile of the teeth are equally important. If you look head-on at the teeth of a miter saw blade, you'll notice that the tops of the teeth are beveled in alternating directions, see drawing in margin at right. TOP-BEVEL ANGLE. The reason for this is simple. This top-bevel angle creates a knife-like point that scores the edges of the cut. This scoring action minimizes chipout and splintering. The steeper the top-bevel angle on the teeth, the greater the scoring action on the cut. 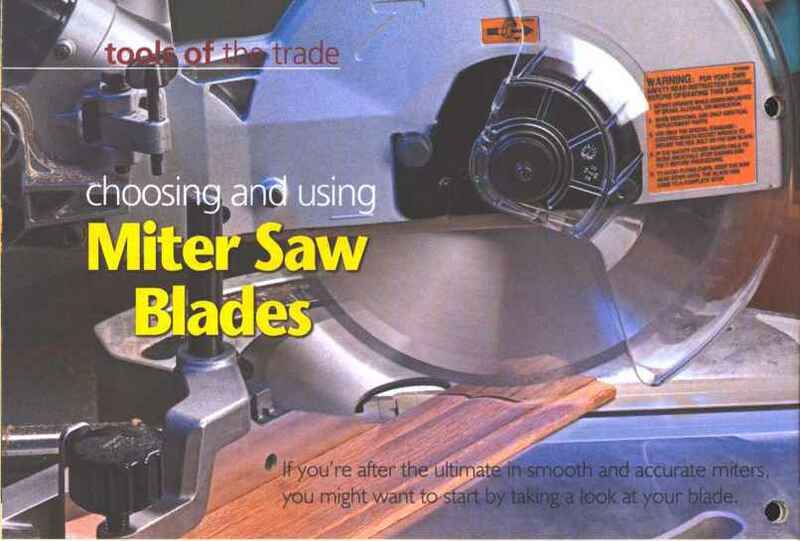 This is true not only for miter saw blades, but for crosscut and combination blades designed for table saws as well. But there's a trade off. As you increase the top-bevel angle, the teeth become more "pointy" and fragile. This can lead to chipped and broken teeth. So manufacturers have to strike a balance between durability and quality of cut. For the cleanest cuts, you want a miter saw blade that has a top-bevel angle around 25°. Most table saw blades have a fairly high, positive angle. In other words, the teeth "lean" forward. This allows the teeth to aggressively slice through the wood as the workpiece is fed into the blade, see left drawing above. 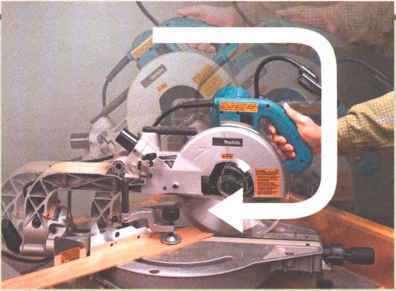 On a table saw, this works to your advantage because the rotation of the blade actually helps hold the workpiece down on the saw.